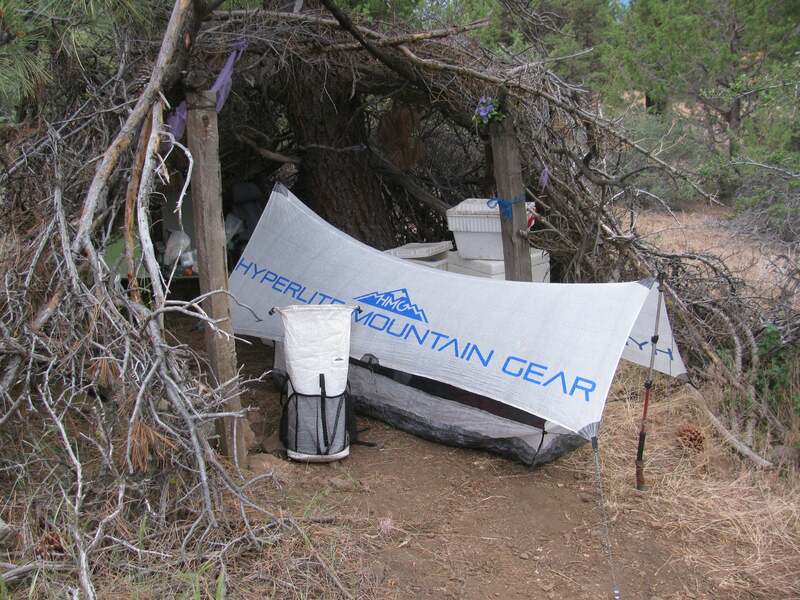 Hi everybody Straight Jacket here, back to do a review of the Hyperlite Mountain Gear pack and shelter I used for my Pacific Crest Trail Thru Hike. Durability: Started the trail with this shelter and used it the whole way through, all 2655 miles of it, and it held up great with no major issues affecting the durability at all. The only problem at all in fact, a small hole in the tarp (not sure how it happened) was very easy to repair with a patch of the cuben bonding tape. As for the insert the floor especially was bombproof, I used it the whole trail without a ground cloth, camping many times on gravel, rocks and other not so nice surfaces and never had a problem with it. All the zippers and hardware held up fine, and with the exception of one frayed guy line from snagging on a rock the lines to held up great. Setup/Versatility: Overall the setup of the Echo proved to be quit straight forward and the versatility of this shelter came in very handy. The line locks on the tarp and clip in bungees on the insert made setup simple, it was very nice to be able to place the stakes and then adjust them later without having to constantly move them around to find a rock free spot at the right tension. 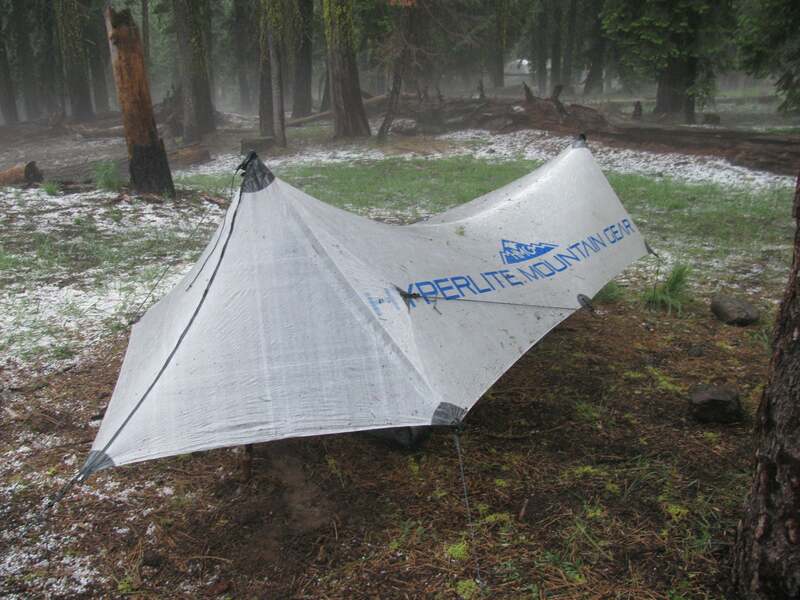 The tarp is also very easy to get crazy taught, a common problem with many silnylon tarps and since it was cuben it stayed taught, retensioning was never an issue. 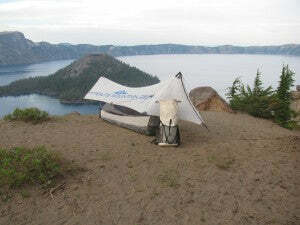 With a wide range of setup options I was always able to have exactly the setup I required, a full shelter with beak for stormy nights, a tarp and bug net to provide bug protection but still vent well when both condensation and dew were an issue, just a bug net when I wanted bug protection and maximum ventilation or when there was no room to set up a full tarp, or a ground sheet to put my pad and bag on top of when i just wanted to cowboy camp. The one catch 22 with all this versatility however proved to be that when setting up everything setup can take a good bit longer then it would with a normal fully integrated shelter, this never really proved to be a major issue, since it does lessen the setup time when only using parts. Size: The Echo was a very nice compromise between being large enough to provide good storm coverage and small enough to keep the weight low. It does feel a little bit a bit on the small side when huddled in there trying to stay out of the bugs or rain, but any other shelter in its weight class is just as small. Although I had insanely good luck with the weather, (it hardly rained at all) the few times it did rain the Echo provided very adequate protection as long as I set up the beak. The two big storms, the one on the first night of the kickoff, and the thunder and hail storm i got hit with at Drakesbad just past the halfway point, I stayed totally dry, and thanks to the sizable vestibule provided by the beak so did my gear. So all in all the Echo performed very well, it was everything I needed and nothing I didn’t, I would certainly recommend it to others and will definitely use it again for future hikes. Windrider Pack I used the Windrider for approximately 1500 miles from South Lake Tahoe until Canada. Durability: Despite my initial doubts about how a cuben fiber pack would hold up (having seen other packs made with lightweight cuben shred in no time) it held up quite well and I was very glad for the heavier 3 oz cuben despite the weight gain. The construction proved to be top notch with all the stitching staying intact. In addition despite all the overgrown trail and blow downs throughout the northern half of the trail the pack stood up to the constant abuse of being snagged on branches, dragged over blow downs, and forced through some very thick overgrowth, very well with no tears in either the main body or even the side and rear mesh pockets. Comfort: Although I felt and still feel that aluminum stays are the best way of supporting a pack’s load, the plastic stays of the Windrider carried well after they had a few days to mold into shape. I also tend to like my hip belts and shoulder straps to be a little bit on the wider side, but this is purely personal preference and I have met many people who like the skinnier straps more. This pack did quite well when loaded with my 8lb or so base weight combined with up to 5-6 days of food and 1-2 liters of water, putting it at around 28 lbs. So for the part of the trail I used it for it was great, I think for the Sierras where I was carrying 12 days of food, I would prefer something with a more substantial frame, more volume and definitely an ice ax loop, the next pack Hyperlite Mountain Gear is designing specifically tailored for the western trails sounds like it would fit the bill perfectly. Size: The volume of the Windrider fit in everything I needed not problem for the full time I used it, the main pack body fit most of my gear and then my non water sensitive items (having a waterproof pack was very cool, i even seam sealed the rear seams, the only ones that weren’t already taped, so I never had to worry about getting my gear wet) and stuff i wanted to have readily available in the mesh. The side pockets each fit a 20 oz Gatorade along with some bars sunglasses or other small item no problem, and the back mash had plenty of room for both my rain jacket and fleece along with some other small stuff stuffed in between. The hip belt pockets were a perfect size allowing me quick access to my spoon (a thru hikers most important piece of gear) headlamp, ipod and other important items quickly. The one caveat though, although it worked great for the north half of the trail, again I would want something different for the Sierras, fitting a bear canister in here along with 10+ days food would be difficult at best. 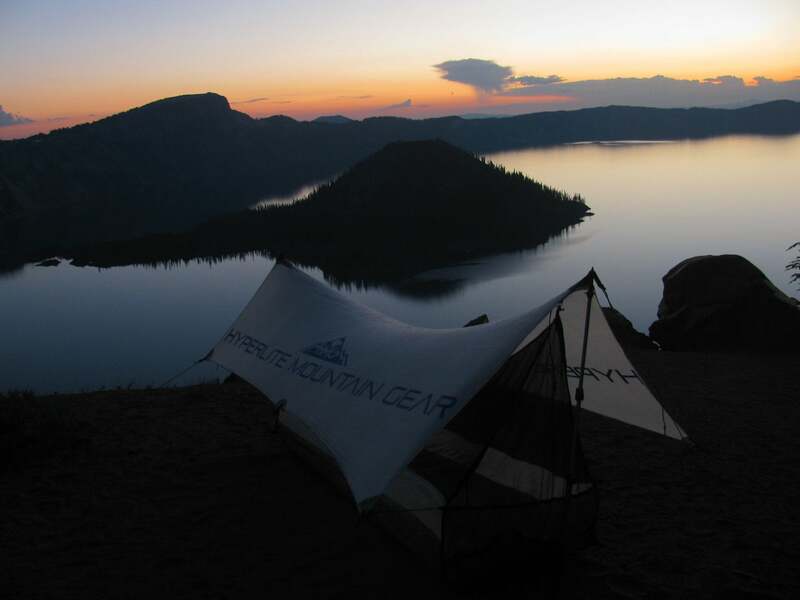 Overall I think this would be a great pack for anyone to hike the AT with (due to the lower weight and volume of significantly shorter resupplies) and parts of the PCT with, but for more remote sections of trail without resupply access every 5 days or so I would look for Hyperlite Mountain Gear’s next pack. Thanks again to all the guys at Hyperlite Mountain Gear for all your help and I look forward to seeing what you have in store for the future. The post Echo I and Windrider Pack Review appeared first on Hyperlite Mountain Gear Blog.